I love it when you find a recipe that you know you already have all of the ingredients, even if you are snowed in, or haven't gone shopping in a while. 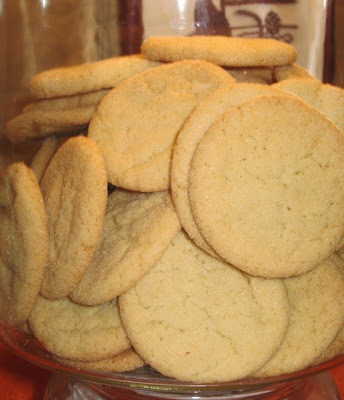 That describes this super quick, super easy, super tasty lemon butter cookie. In a medium bowl, cream together the butter and sugar until it is very light and fluffy (this takes a few minutes at high speed). Beat in egg, corn syrup and extracts. Add the flour, baking soda & baking powder and mix well. Roll dough into 1" balls then roll the balls in granulated sugar. Place them on a parchment lined cookie sheet about 2 or 3 inches a part. Bake in preheated 325 degree oven for 12 minutes or until they are just golden around the edges. Your lemon cookis look very yummy! It's been a while since I've done a little blog hopping - I love the new look (sorry I don't know how new it is) - love catching up on your recipes, you always have something tasty to try! Oh yeah..it always make my day when I have everything in my house to make something yummy. While I don't get snowed in here in Florida..sometime I hate getting out of my pj's to go to the store !! Another great lemon recipe. My son will love these. Thanks. Nothing better than home baked cookies. Lemon and butter- what could be better? I bet some zest would be good in there too!